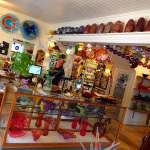 Have been loving my summer job at Glassworks Studio & Glallery in Estes Park, Colorado! We do live glassblowing 7 days a week and are located in the heart of beautiful Estes downtown of the main street Elkhorn ave.
Estes Park’s Center for Glass Blowing is Patterson Glassblowing & Studio. You can’t get better than watching our master artisan’s blow beautiful, colorful, molten glass right before your eyes. See a bowl take shape, a handle applied to a pitcher, a humming bird take off with the masterful ease of decades of dedicated attention to detail and artistry. The array of glassware is endless flowing like the molten glass that is the essence of the medium from one room to the next. Our groupings of vases, bowls, serving ware and decorative objects of glass art delight the eye and tempt you to change the groupings even if it is only in your minds eye. Enjoy all of our small creations. Hold up a bowl to the light, try on a bracelet, let your eye wander the colorful array of glassware all ready to find a home, maybe yours….